You have added At the Resort Patterned High Low Dress into shopping cart. You’ll be ready to spend a week at your tropical vacation resort in this dress! We love the bright and bold patterns! The At the Resort Patterned High Low Dress is fully lined. It has a beautiful crochet sweetheart lace top with adjustable spaghetti straps. The bust is also lightly padded for support. The attached skirt has a unique floral and chevron pattern that has a tropical feel. The back is elastic which adds stretch to comfort. A detachable belt wraps around the waist adding contrast. A hidden back zipper completes the dress. This dress is perfect for your next tropical vacation! Pair this with beaded sandals and a sunhat for vacation vibes. Also can be worn with pretty jewelry and wedges for a dressier look. Details: Fully lined. Padded bust. Adjustable spaghetti straps. Hidden back zipper. 100% polyester. Contrast: 70% cotton, 30% nylon. Lining: 100% polyester. Remove belt. Hand wash in cold water. Do not bleach. Line dry. Cool iron reverse if needed. Small measurements: Length from top of bust to hemline: 26”-38”. Bust: 31”. You have added At the Resort Patterned High Low Dress into Wishlist. You have added At the Resort Patterned High Low Dress for Stock Notification. 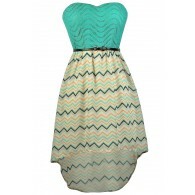 You have set At the Resort Patterned High Low Dress as a loved product. You have removed At the Resort Patterned High Low Dress as a loved product.